Sometimes space news really manages to strike a chord with people. Yesterday, it seems, was one of those moments, with the announcement that amino acids had been discovered in comets for the very first time. Within hours, half the news sites on the internet picked up on the story, from the BBC to Scientific American. Understandably so, as this is a pretty big discovery — with even bigger implications! Now amino acids are pretty big news for astrochemical folks like me. To be perfectly honest, the discovery that comets can harbour amino acids didn’t come as any surprise to me. It was more of a reassurance that all is right in the Universe. After all, we know amino acids can form in meteorites. We’ve even found nucleobases in those! Amino acids have been shown to form favourably through good old fashioned thermodynamics, and even chemical theorists not unlike myself have been in on the act of trying to find them in space. But in comets? The fact that now we know for sure* opens up a few interesting thoughts. One is the old concept of panspermia. And when I say old, I really do mean it. The idea goes back hundreds of years, with various philosophers and scientists pondering whether life could’ve fallen from the heavens. The most prominent recent proponent of the idea, though, was Sir Fred Hoyle. Hoyle was a firm believer that life itself formed in space, before it arrived to blossom here on Earth. Panspermia tells us that comets could be the seeds from which life grew. Just like any other seed, all they needed was plenty of water and the right amount of sunlight. Comets really are a hotbed of chemical activity**, containing, in particular, plentiful carbon, oxygen and nitrogen. Reactions between these chemicals could be driven by any number of things. Ultraviolet light, either from the Sun or from other stars can drive chemistry in the outer reaches of the solar system where comets commonly lurk. 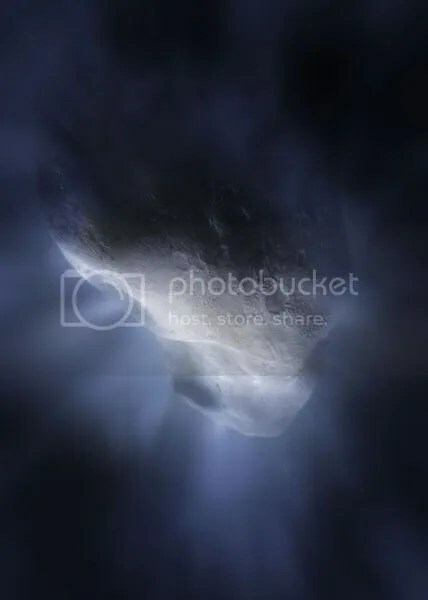 Alternatively radioactive elements in the comets themselves would create heat as they decayed, causing pockets of warm liquid water for chemistry to take place (coupled with ionising radiation to initiate the chemical reactions therein). No surprise then, that we should find amino acids in them. Considering all of this, it doesn’t even seem unreasonable that some kind of primitive life might have formed inside a comet before being delivered to a planet later to fend for itself. At risk of descending into flagrant speculation (which is all too easily done on such a fascinating topic), the Sun is believed to be surrounded by billions and billions of comets. Some of these comets are occasionally flung straight out of the solar system, to sail off aimlessly into the night. And the Sun is just one of many billions of stars in the Milky Way. Even if only a small fraction of these comets contain the fundamental ingredients of life, it certainly lends a lot of weight to the idea of panspermia. Maybe David Darling was right. Perhaps life really is everywhere. *And believe me, science is all about knowing things for sure. Don’t mind my idle speculations, by the way. That’s what a blog’s for, after all. This entry was posted in astrobiology, Imported from Livejournal and tagged astrochemistry, comets. Bookmark the permalink.